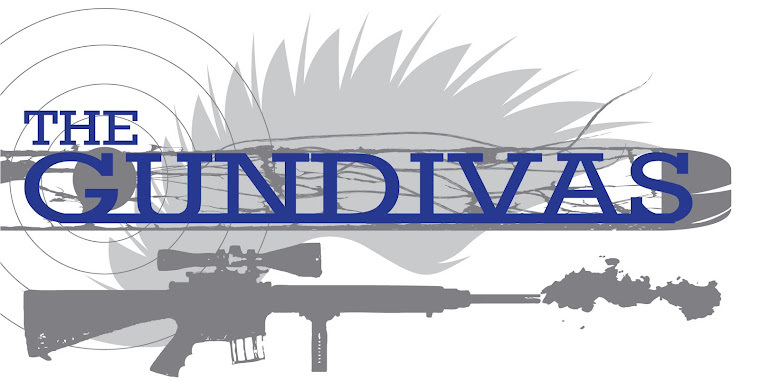 A few weeks ago, Gundiva uploaded a post showing some of the fun toys we played with on Industry Day. For this post, I want to give more details on what we played with. For 2014, Glock introduced 2 new models. First up, the model 41. Basically the model 41 is the same as existing model 21 but with a 5.3 inch barrel. It is built on the Gen 4 frame and uses the same 13 round magazine as the model 21. And best of all, it is chambered for the great .45 ACP cartridge. If you are looking for a nice competition model in .45, Glock now has a model for you. Next up is the model 42. 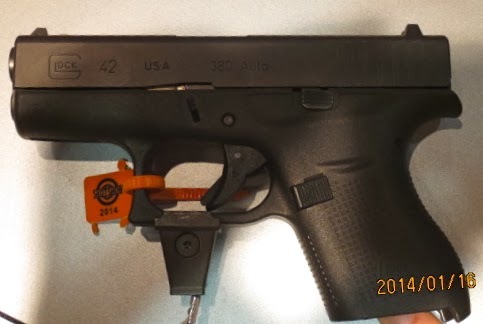 This is the smallest Glock. It is a pocket pistol chambered in .380 ACP. I found this a nice rendition of the pocket pistol. It sat nicely in the hand. Was accurate, easy to shoot and soft recoiling. I think this will be a popular seller for Glock. Now to kick Glock in the shins a bit. ABOUT FRICKIN’ TIME GLOCK CAME OUT WITH THESE TWO MODELS. Glocks competitors have had similar models out for YEARS!!!! Way to be a Johnny come lately. Now to redeem themselves, Glock MUST come out with a pocket 9mm to catch up with the rest of the industry. And sooner the better. Otherwise, I think both of these models are fine additions to the Glock lineup of handguns. Smith introduced several new models this year. I will confine this post to the 2 models I actually test fired. I will write a separate post outlining all of Smith’s new models at a later date. First up is the new model 69. 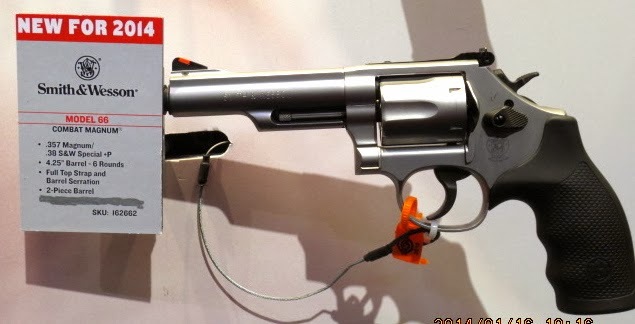 The model 69 is a stainless steel 5 shot .44 magnum revolver, built on Smith’s medium L frame and a 4 inch barrel. It is a bit smaller than the N-frame and fits in the hand nicely. Still a handful to shoot, but I see this as a nice backpacking gun. You have the convenient size of a .357 with the extra horsepower of the .44 magnum cartridge. Next up, is the new 986. The model 986 is another model built on the medium L frame and is part of Smith’s Pro series of revolvers. It is chambered in 9mm and is aimed at competition shooters who want to stay with the 9mm cartridge. It has a 5 inch barrel and 7 shot cylinder that is made out of titanium to help keep weight down and improve balance. It is loaded by the use of moon clips, which greatly speeds up the reloading process. I found this a pleasant revolver to shoot. If you like the 9mm cartridge and want to get into shooting revolvers, this may be the ticket for you as you do not need to buy (or reload) a new cartridge. Here is a fun toy for your AR rifle. The best way to describe the Tac-con trigger is it is a drop in replacement for your factory trigger that has the ability to give you near full-auto rate of fire. But it is NOT an actual full-auto trigger assembly. All it does is help you press the trigger really fast. Thus is does not need an NFA license. It does take some practice to get the rhythm down. But once you do, you have near full-auto rate of fire. And a smile on your face. See the video and description on the website for a better explanation. I had a fun time firing the new SR762 rifle. Basically this is Rugers take on the AR10 platform, just piston driven instead of direct impingement. Chambered in .308, It was very pleasant to shoot and accurate as well. The only things I did not like, was the generic AR trigger and the generic mil-spec collapsible stock. I think with a trigger and stock upgrade this will be a fine rifle. The other good news is it uses the Magpul pattern magazines. I would love to get ahold of one for detailed testing and review. Here is an interesting line of pistols. You may not have heard of Sphinx here in the united states. But they are well known in Europe. They are a Swiss made pistol and well known amongst competitive shooters around the world. They are a double action pistol, similar to a Sig Sauer, just nicer. I found the trigger excellent on this pistol. Smooth with and crisp break. The grip was also excellent. Very comfortable in the hand. It was also very pleasant to shoot, very comfortable. If you come across these pistols, don’t overlook them. I think you will be pleasantly surprised. 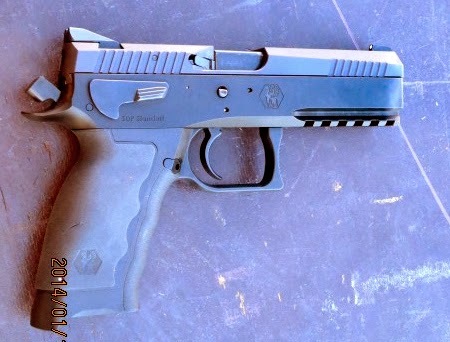 Caracal is a relative new comer to the American market. A few years ago they introduced their pistols. Basically a variation of the Glock design. But nicely done. Unfortunately they did not bring any of their pistols to Industry day. What they did have were 2 rifles. A carbine and a precision rifle. The carbine is chambered in 9mm and uses the same magazines as their pistol. It comes with a basic set of iron sights. But also includes a picatinny rail for mounting an optic. The safety consists of a basic crossbolt safety and a grip safety. Similar to a 1911 handgun. The carbine handled and shot well. The trigger was a little mushy, but fine for what it was designed for. A light tactical carbine. Overall a fun carbine to shoot. And I liked that is shared the same magazine as the pistol. The real jewel from Caracal is their precision rifle. This rifle is not out in the states yet, but they anticipate to have ATF approval sometime in 2014 and start importing them. No pricing was available, but they did say it will be priced competitively. I interpret this to mean sub $1000. Hope I am right about the pricing. The rifle I test fired was chambered in .308. An aluminum body, free floated barrel, 10 round detachable magazine. And the best part, a fully adjustable stock. You can adjust the cheek piece for height. The length of pull is also adjustable. You can fit this rifle to just about anybody. This rifle was a joy to shoot since it could be adjusted to fit me. 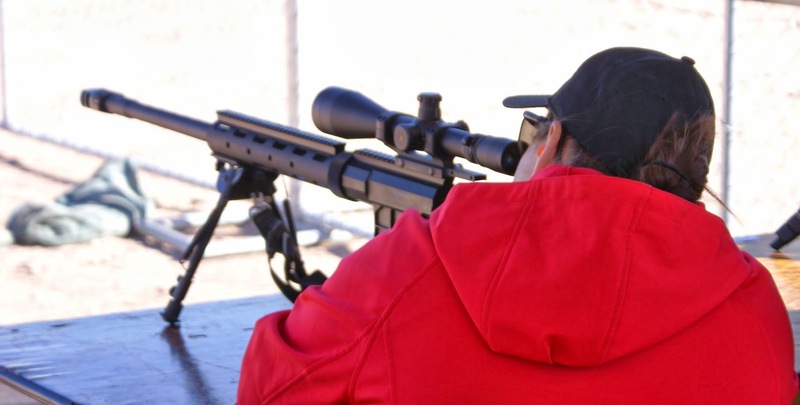 A proper fit on a rifle is important to accuracy and comfort. It had a very nice trigger. Smooth and crisp and not too heavy. I really liked this precision rifle. And I look forward to its release in America. Don’t turn your nose up at this rifle when it becomes available just because it is designed/made in the U.A.E. If I am right on the pricing, you will get a lot of value for your money. Last up is Springfield Armory. Springfield is the maker of 1911 handguns, M1A rifles and the popular XD/XDM/XDs handguns. A very good company that makes fine products. Not much new this year other than they now make their 1911 Range Officer in 9mm. For 1911 purists this may be sacrilege. But don’t discount the 9mm cartridge. It does very well in the 1911 platform. Other than the sharp edges on safety catch, this pistol was pleasant to shoot. Mild recoil, but very accurate. I will post a more detailed review the Range Officer at a later date. This is all I have for Industry day. But there will be more posts about the other items we saw at SHOT show 2014. 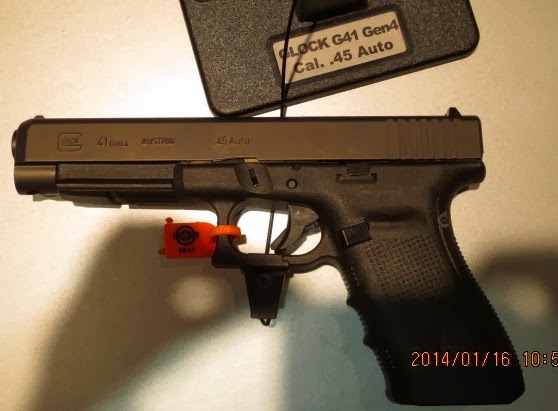 I've got a line on a Glock 42; hoping to have it in my hands this week. I loved that little gun. Great info! Now...to rob a bank in search of gun money. I don't have a favorite one just yet, I am partial to anything that fires bullets.